On a rainy day in Greensboro, North Carolina, Nevada Mareno swept the 800m (U.S. No. 6, 2:08.51), 1600m (4:51.57) and 3200m (U.S. No. 8, 10:17.7) at the North Carolina Class 4A State Championship. 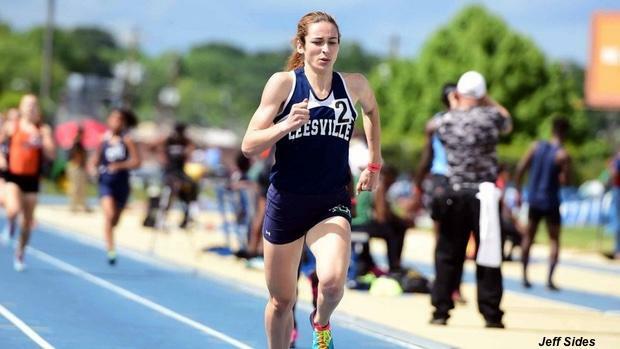 She also ran the third leg of the Leesville Road 4x800m (U.S. No. 6, 9:06) as the team finished third in the team standings. Mareno's times in the 800m and 3200m stand as new state meet records. After the meet, the high school junior and 2015 indoor mile national champion said she plans to race the adidas Dream Mile on Friday, June 17, and possibly double back for New Balance Nationals Outdoor on Saturday and/or Sunday the same weekend. She may have time to make the NBNO Championship 4x800m final on Saturday night at 7:00 p.m. if she chooses. Leesville Road took runner-up honors at 2015 indoor nationals with Mareno on the squad, and she and teammate G'Jasmyne Butler are a formidable one-two punch. Butler placed second at state in 2:10.44, and ran the squad's fastest relay split at 2:12 on the anchor. The Green Hope boys 4x800m ran U.S. No. 2, 7:38.83, to set a new state record. They were the top Americans at the Penn Relays Carnival. Third leg Jayquan Williams later won the 800m individual state title in 1:51.46. Penn Relays champion Anna Cockrell nabbed four golds at the NCISAA Class 3A Championship; she clocked U.S. No. 1, 40.42, in the 300m hurdles; plus ran 11.63 (+1.3) in the 100m, 13.52 (+0.5) for the 100m hurdles, and 23.66 (-1.2) in the 200m. Her Providence Day squad won the girls team title with 130 points. Hillside senior Marcus Krah clocked the wind-legal U.S. No. 1, 13.32 (+1.1), in the 110m hurdles, plus wins in the long jump (23-0) and triple jump (48-8).